To gain an overview of the Battle of Messines click here to visit First World War dot com. 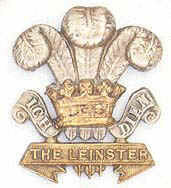 As part of the 24th Division, the 2/Leinsters were part of the 73rd Brigade. The other brigade in the Division was the 72nd. The 2 Battalion of the Leinsters moved to Messines in April 1916 into trenches overlooked by the enemy along the Messines Ridge. This made any movement during the day very dangerous. At the time the brigade was under the command of Lt.Col Bullen-Smith (Leinsters) with two battalions, the 13th Middlesex temporarily commanded by Major RAH Orpen-Palmer of the Leinsters, and the 2 Bn Leinsters commanded by Captain A D Murphy. On the 30th April a gas attack was launched against the Leinster line by the enemy as a prelude to an attempt to destroy a mineshaft held by the North Staffordshires. The attack was eventually repelled but in the process Leinster casualties were 19 men gassed, 30 wounded and six killed in action. The 2/Leinsters remained at Messines until 25th July 1916 when they moved to the Somme, and as several postings and promotions had taken place, the 2/Leinsters moved out with a strength of 900 commanded by Lt.Col RAH Orpen-Palmer DSO, Major A D Murphy, MC as 2 i/c, Lt. Palin as adjutant and four companies of men. A Coy commanded by Capt Morrogh. C Coy Captain T H Poole, MM. The 2/Leinsters returned to Flanders in preparation for the Battle of Messines on the 3rd June 1917 and moved into Ottawa Camp, behind Dickebusch near Ouderdom and at midnight 6/7th June went forward to the assembly trenches, five men being gassed on route. At dawn on the 7th June the 2/Leinsters witnessed the explosion of the Great Mines. The 2/Leinsters were on he left flank of the main attack and moved forward to relieve the 15th London Regiment who were occupying the former front line of the enemy, approximately halfway between St Eloi and Hollebeke. Second Lieutenants Sikes, Leather & O'Brien were wounded during the action, eight-one men were wounded and seventeen killed in action. 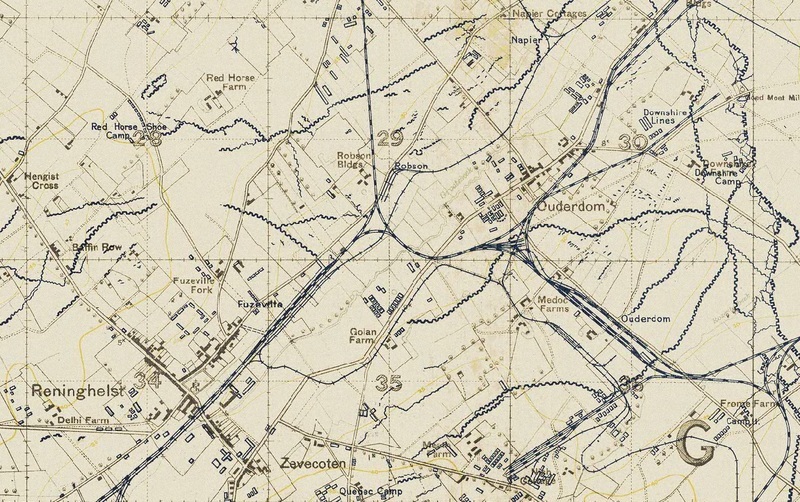 The 2/Leinsters involvement in the Battle of Messines had been relatively minor, though important as part of the complete and overall strategy it had achieved a 2,000 yard advance to the Oosterverne line. On the 11th June the battalion returned to Ottawa camp and on the 13th moved out for their new destination at Hill 60. As part of IX Corps, the 16th (Irish) Division with the 7/Leinsters moved into the line on the 5th June from Clare Camp near Bailleul. The 16th (Irish) were (from left to right) 7th Inniskillings, 7/8th Royal Irish Fusiliers, 7th Leinsters, & 6th Royal Irish Regiment. Support Line (third and fourth waves) in Park Lane. At 3.10 am the mines were exploded and immediately in front of the battalion "three great columns appeared out of the earth and rose slowly, majestically almost" Blinded with dust & fumes the 7/Leinsters moved moved forward, many men becoming lost with visibility less than five metres, into the weakened enemy front line of the 4th Grenadier Regiment and 33rd Fusiliers, overrunning and capturing those positions within twenty minutes. The 3rd and 4th waves moving forward completed their objectives within 1 hour 40 minutes from the start of the battle. Unfortunately not all the action had proceeded smoothly and just as the advances commenced the H.Q. position at Lunette Dug-Outs came under shell fire with one shell a direct hit on the door severely wounding Lt. Col T R A Stannus, and adjutant Capt E L L Acton MC. Trench mortar office Capt Roche was killed. Captain J A J Farell assumed command of the 7/Leinsters and 2/lt A H Whitehead was appointed adjutant. The final casualty list was eight officers wounded, fifteen other ranks killed and ninety-two wounded. The battle for Messines Ridge was considered to be a great success, due in no small part to the officers and men who made the first entry into No Mans land into some of the most nerve shattering conditions then experienced. It is recorded in the Regimental History that "of these, the 7/Leinsters were amongst the first, and nobly did they perform their allotted task"